As part of today's massive software deployment from Apple, our old friend iPhone received an iOS, touch enabled makeover and is now available as a $4.99 app for iPhone, iPad, and iPod touch. 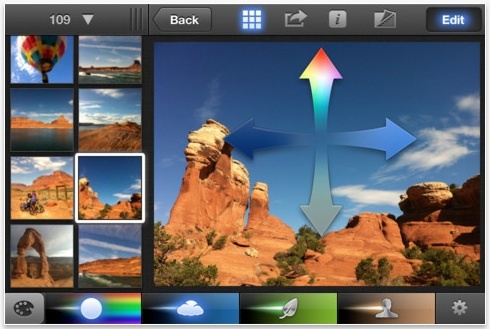 "With iPhoto for iOS, Apple brings Multi-Touch to photography in a breakthrough way. Browse, edit, and share your photos from your iPad or iPhone, like never before – all the powerful tools you need are at your fingertips. And with iCloud, you can share your experiences as stunning photo journals." iPhoto for iOS is compatible with iPhone 4, iPhone 4S, iPad 2 Wi-Fi, and iPad 2 Wi-Fi + 3G and requires iOS 5.1 or later. You can purchase iPhoto for iOS from the iTunes Store. The app has a lot more picture remodeling functionality than you might anticipate from first impact, including completely non-destructive modifying that can be precisely unfastened. It also increases a bit on the conventional Images app's company, and significantly increases sharing options.